Texas Rangers Cards: Early off-season. The off-season is trading time. All the teams engage in wheeling and dealing. I know, the off-season doesn't officially start until the World Series is over but we're close enough. I haven't had a trade in awhile and would like to remedy that. Of particular interest would be Rangers game-used and autographs I don't have. 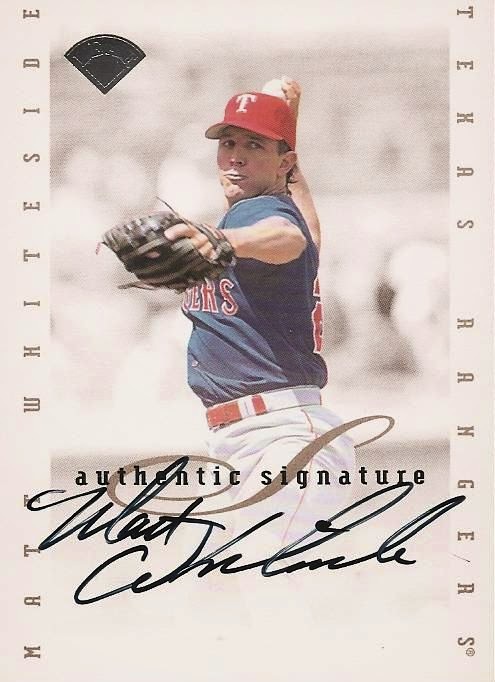 They don't have to be stars, ones like this 1996 Leaf Authentic Signatures card of Matt Whiteside would be fine. This section of my collection is a bit thin and I'd like to bulk it up a bit. Of course, I'm also still trying to knock out the Rangers base team sets. I'm always interested in trading for any cards off my wantlist. Senators are welcome too, especially off the Washington wantlist. I'd even consider a blind team lot trade, if anyone is interested. Other than the Rangers, I occasionally pick up cards of Bob Gibson, Lou Brock, and Stan Musial. I'd also consider any Royals parallels or inserts. Mark the Royals fan has most of the base cards already so it doesn't do me much good to pick them up. Of course, if you have anything of Jon Matlack from the Matlack wantlist be sure and let me know. I've been slowly revamping my tradelist so if you see anything there you might be interested in, now is the time to speak up. Some of the cards listed will be disappearing in the coming weeks. I'd like to trade base for base, vintage for vintage, inserts for inserts, etc. but if you make an offer I'll listen. I'll even look through your tradelist if you see something off mine you like. I also have some Ivan Rodriguez memorabilia not listed on the trade list that I'd like to get traded to a good home so let me know if that catches your interest. Well, that's my attempt to kick the hot stove season off to an early start. Let me know if we can work a deal.